It’s time for Paleo Funnel Cake! Oh, the fair. Carnival rides, overpriced stuffed toys, and fried, greasy foods. Nothing like it, right? Not really the place for grain-free funnel cakes, though. I’ve only tried traditional funnel cake a few times, but they burned a sweet, greasy image into my tastebuds. These grain-free cinnamon funnel cakes are seriously good. They are reminiscent of the real thing, but without the nasty stuff that goes along with fair food. They were gobbled up almost as fast I could make them! Heat oil in a large pot over medium heat until a drop of batter immediately sizzles and floats to top. While the oil is heating, mix dry ingredients in a large bowl. In a separate bowl, whisk together the eggs, syrup or honey, and sparkling water. Add to dry ingredients and stir to combine. Once oil is ready, using a large serving spoon (the kind you would use to serve a dinner casserole or something), pour a spoonful of batter straight into the oil. Note: You could put some batter into a large Ziploc bag, cut off a corner, and “funnel” the batter out, but this was oh, so much easier, and worked just as well. Don’t swirl the batter around, just pour it into a “pile.” It will float to the top. Add another pile in, if you have room, and let cook, undisturbed, until the bottom is golden brown. Gently turn over and fry the other side, until done. Remove onto a wire rack covered with paper towels. Eat while still warm. P.S. You could top these with powdered sugar, cinnamon sugar, or a homemade glaze if you so desire, I just avoid processed sugar and so didn’t use any. I haven’t seen any gluten free/cornstarch free baking powder. What brand do you use? Btw, I love all you are doing. I have a child with too many food intolerances to list. Your ideas have kept my family going. And I just started the whole 30! This is only my 5th day but I feel amazing! Hi, Jill! I get Hain brand at Whole Foods. It’s on Amazon, too, I think. Thank you for the encouragement! It’s so nice to hear when someone appreciates all the work! lol Hope that helps–let me know if you have any more questions! I make my own baking powder by mixing two parts cream of tartar and one part baking soda. it works really well for me! I seriously want these RIGHT now! But alas, I’m doing another Whole30. However, this WILL be the first thing I make when its over! Thanks!!! These look delicious. 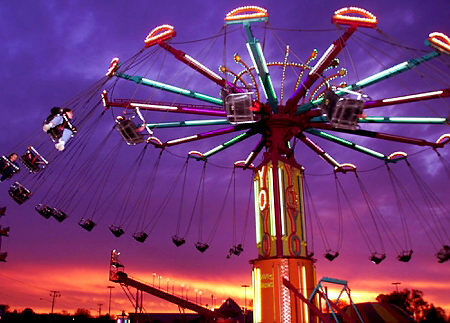 I’m going to the fair tomorrow night and will try to resist getting some there. If I make these instead, that will help. How many “cakes” did you get out of this recipe? Can you please include the servings and amounts in your recipes? Sorry, I forgot. Sometimes I remember, sometimes I don’t. lol I fixed it. Thanks! I’m making these now. I have both tapioca and arrowroot….does one work better than the other? Hi, Tina! Which one did you end up using? I use tapioca, but either should work fine. I used tapioca. They were wonderful! Definitely only a one year treat though. They used a LOT of oil. Thanks for the recipe. My family said definitely a keeper! Yes, definitely a keeper! Eat these before going to the fair to steel your resolve : ) My entire family loved them, even the Paleo naysayers. I subbed coconut/palm sugar for the maple syrup and had to keep a very close eye on the oil temperature to keep them from burning, but these are wonderful! What is the sparkling water for? Any substitutes for that? The carbonations helps “fluff” it up…I’m not sure what exactly you could sub out for it…you could maybe Google it? Sorry, I’m pressed for time and won’t have time to check it out tonight! I made these but they were not crispy at all:( they turned out more like my typical almond flour pancake ::(( what did I do wrong? Hi, Emma! Yes, mine were a light crispy on the outside, and warm and soft on the inside. I’m not sure what happened for you…did you fry them long enough? Was the oil hot enough? Did you follow the recipe exactly? I’m so sorry they were a dud for you!